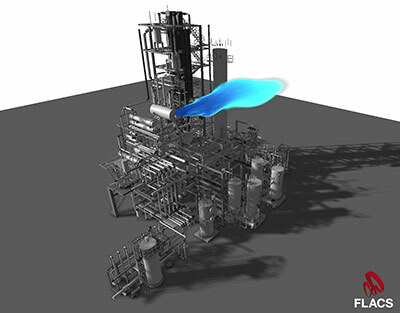 FLACS is the industry standard for CFD modelling and one of the best validated tools for modelling flammable and toxic releases in the industrial safety context. By modelling with CFD in full 3D it is possible to predict consequences more accurately and to include the effect of all contributing and mitigating effects, such as confinement and congestions due to real geometry, ventilation and deluge. FLACS combines the power and versatility of 3D CFD models with more than 35 years of extensive validation work and intuitive graphical user interface. 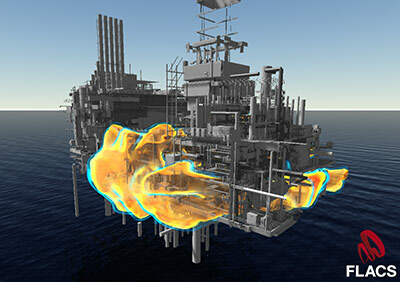 This combination provides a comprehensive, yet easy to use, software tool for modelling dispersion and explosion consequences in full 3D for all typical flammable and toxic release scenarios. FLACS is used extensively in the oil, gas and process industries, in a number of nuclear institutes and increasingly many other industries. A better understanding and higher accuracy of results contributes to raising the true level of safety and allows designers to choose effective design options and mitigation measures, and thereby improve safety and manage project cost. Safety studies are often only a modest part of the total project scope. However, the results of these studies provide important input to disciplines such as process, structural and piping and can therefore have a wide impact on project design choices and subsequently cost/schedule. With ever more complex installations and projects, it is paramount to use the most accurate and validated 3D consequence and modelling tool available. FLACS provides a solid framework for evaluating various design options and helps in choosing the most cost efficient and practical measures to reduce risk. It can help your company or your clients achieve the expected high standards of safety.